#EdwardMillingtonSynge (pronounced sing) was born in 1860 in Great Malvern. Educated in Norwich and then Trinity College, Cambridge. He became a land agent. He loved to draw and one day saw an advert in a shop window saying ‘Etching taught here’. And so this artist found, by accident, the field of art which was to become his future. He continued his studies at the Westminster School of Art and was advised in his studies by Franke Short and Sir Seymour Haden. Synge began displaying at major etching exhibitions. In 1891 he retired from his day job as a land agent and devoted himself to his art. He travelled to Paris (1901) to work along side Carolus Durant and where he set up his own studio. While in Paris, he illustrated ‘The Story of the World’ a book authored by his sister. Travels into Italy and then Spain led to some of his most beautiful and intricate work. He married in 1908 to Miss F. Maloney, an artist erself. Synge moved back to England and continued to work in a charming studio in Surrey. He died in 1913. Over the last number of years Synge aided by his wife printed all his own works. Many of his 370 plates were for ‘The Art Journal’ and ‘The Graphic’ magazines. The image above is of #EmbrunCathedral. It was a Roman Catholic Cathedral but is now a national monument of France. The interior has an elaborate Baroque high altar inlaid in coloured marbles, recently rediscovered frescoes, and an organ (the oldest working in France) donated by Louis XI. The image is of the north nave aisle showing it’s monuments and end chapel. A superb atmospheric etching by a sublimely talented artist. 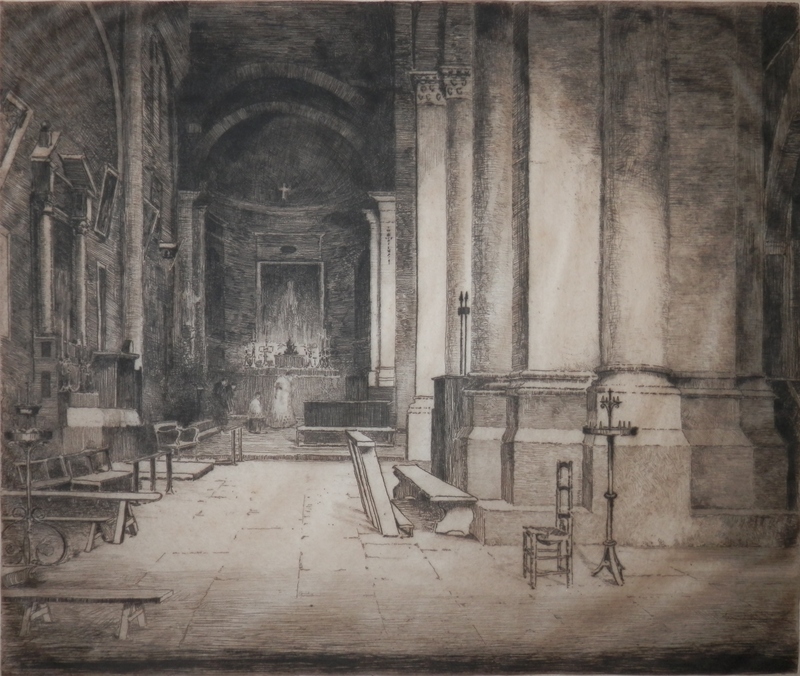 This entry was posted in Etching and tagged aisle, church, Embrun Cathedral, France, memorial, monument. Bookmark the permalink.